Protons and neutrons (alias, the nucleons) constitute the building blocks of matter, accounting for almost all the mass of our world. Even if we are still far from understanding their physical inner structure, many efforts have been made to deepen our knowledge about them. Over the past few years, thanks to a fruitful synergy of theoretical and experimental progress, we have started opening the study of new multi-dimensional images of the structure of proton, investigating the behavior of its fundamental constituents, the quarks and gluons. When we look into nucleons with extremely high resolution, we are in the regime of perturbative QCD (in other words, a regime where we can really work out mathematical calculations) and quarks and gluons appear almost free. With the due caveats, we can compare the situation to observing water at extreme magnifications, and seeing quasi-free water molecules. As we reduce the magnification, we realize that the molecules clump together in heavier, composite droplets. Eventually, at low magnification they form a single object, like the proton. Pursuing the analogy, when we are looking at a proton at rest (not smashed inside a collider, for example) it is as if we were unable to describe water starting from the dynamics of molecules. This is because confinement, the reason for quarks and gluons being inescapably bound inside a proton, is left without any rigorous mathematical justification. Confinement is the most crucial characteristic of the theory and represents one of the hardest physics problems of today. 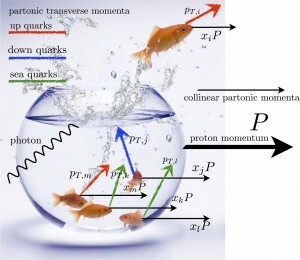 What we can do is to just describe this jam of quarks and gluons giving rise to a proton through mathematical objects specifically introduced in order to “parametrize” our ignorance about its structure: these are what are called parton distribution functions (PDFs), which shape the probability of finding quarks and gluons within a proton. The knowledge of the multi-dimensional structure of protons allows the analysis of properties otherwise inaccessible. The situation may be compared to diagnostic studies: electrocardiography, for example, gives us mono-dimensional information about the hearth activity. It is of fundamental importance, but it does not give detailed information about the multidimensional inner structure. Instead, more important for this purpose are multi-dimensional tomographies of heart activity (MRI, CT and others). The enormous advantages of medical diagnostic imaging literally revolutionized medicine and surgery. In a similar way, the latest “multi-dimensional” pictures of the nucleon obtained with QCD phenomenology can improve the current status of hadronic physics and aim at better understanding particle physics in general. Although one-dimensional (collinear) parton distribution functions are extremely useful for studying any process involving hadrons (including the proton-proton collisions taking place at the LHC), from the point of view of nucleon tomography they are rather limited, because they describe the distribution of partons in a single dimension. More informative distributions are the so-called transverse-momentum-dependent distributions (TMDs). They represent pictures of three-dimensional probabilities in momentum space. The distributions change depending on the energy scale at which they are probed (in a way that is calculable using evolution equations from perturbative QCD) and on the value of the longitudinal fractional momentum. There are many nontrivial questions concerning TMDs that do not have an answer yet, like their most truthful mathematical representation. At present, we know that experimental data form proton-proton and electron-proton collisions point towards Gaussian shapes (if the spin of quarks is neglected), but other forms could do the job as well. An important question concerns the flavor dependence of transverse-momentum-dependent distributions: are up quarks moving in the nucleon with greater velocity than the down ones, or vice versa? What about sea quarks? Are they faster than the other ones? Part of my research activity is devoted to the investigation of this topic, which could be quite relevant both from the theoretical and experimental point of view. 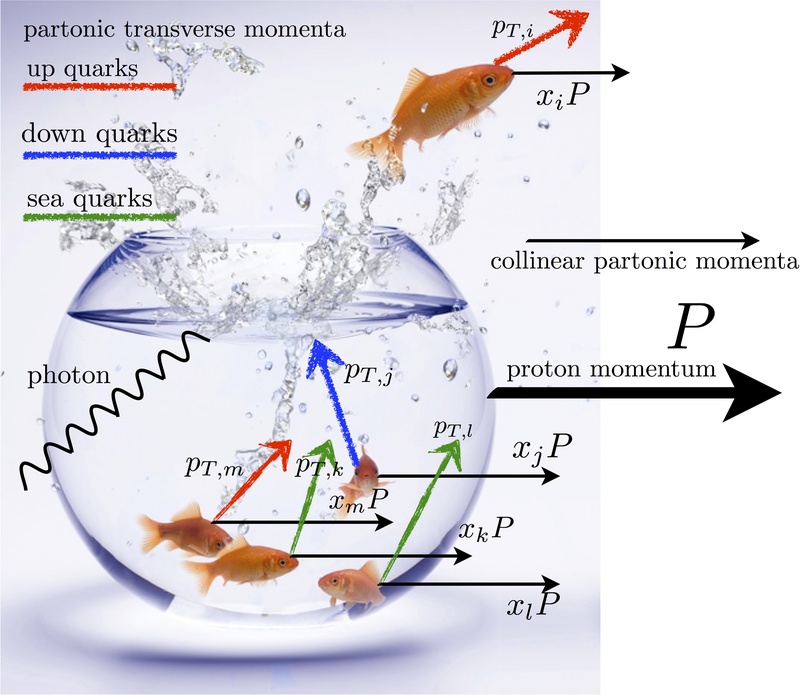 After lot of struggling with data analysis, we now know that sea quarks are likely to be faster than up quarks, which are then faster than down ones. The statistical analysis of the huge amount of data collected at hadron colliders like the Tevatron and the LHC strongly relies on the detailed knowledge of parton distribution functions, both in 1D and 3D (the TMDs!). Before now, data analysis has been carried out assuming that quarks have all the same velocity, but we now know that this is not the case! This means that it will be important to refine the knowledge of quark (and gluons too, in the future) velocities, in order to improve the accuracy and reliability of data analysis. That’s what a PhD student can do during his/her amazing time in scientific research! Surprisingly, the answer to “How does an electron-positron collider produce quarks if neither particle contains any?” all begins with the inconspicuous photon. No Firefox, I Swear “Hadronization” is a Real Word. As far as the history of quantum physics is concerned, the discovery that all light is fundamentally composed of very small particles called photons is a pretty big deal. The discovery allows us to have a very real and tangible description of how light and electrons actually interact, i.e., through the absorption or emission of photon by electrons. 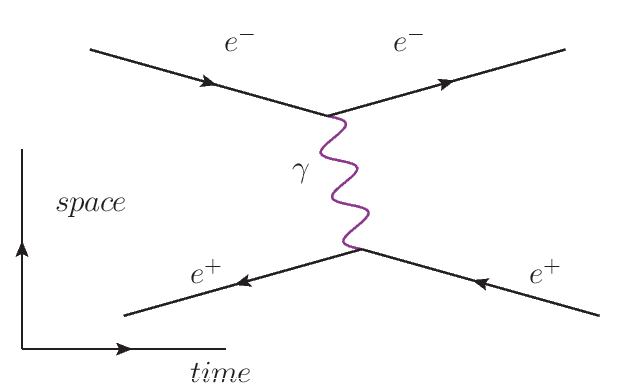 Figure 1: Feynman diagrams demonstrating how electrons (denoted by e–) can accelerate (change direction of motion) by (a) absorbing or (b) emitting a photon (denoted by the Greek letter gamma: γ). The usefulness of recognizing light as being made up many, many photons is kicked up a few notches with the discovery of anti-particles during the 1930s, and in particular the anti-electron, or positron as it is popularly called. In summary, a particle’s anti-particle partner is an identical copy of the particle but all of its charges (like electric, weak, & color!) are the opposite. Consequentially, since positrons (e+) are so similar to electrons (e–) their interactions with light are described just as easily. Figure 2: Feynman diagrams demonstrating how positrons (e+) can accelerate (change direction of motion) by (a) absorbing or (b) emitting a photon (γ). Note: positrons are moving from left to right; the arrow’s direction simply implies that the positron is an anti-particle. Then came Quantum Electrodynamics, a.k.a. QED, which gives us the rules for flipping, twisting, and combining these diagrams in order to describe all kinds of other real, physical phenomena. Instead of electrons interacting with photons (or positrons with photons), what if we wanted to describe electrons interacting with positrons? Well, one way is if an electron exchanges a photon with a positron. Figure 3: A Feynman diagram demonstrating the exchange of a photon (γ) between an electrons (e–) and a positron (e+). Both the electron and positron are traveling from the left to the right. Additionally, not explicitly distinguishing between whether the electron is emitting or absorbing is intentional. And now for the grand process that is the basis of all particle colliders throughout the entire brief* history of the Universe. According to electrodynamics, there is another way electrons and positrons can both interact with a photon. Namely, an electron and positron can annihilate into a photon and the photon can then pair-produce into a new electron and positron pair! Figure 4: A Feynman diagram demonstrating an annihilation of an electrons (e–) and a positron (e+) into a photon (γ) that then produces an e+e– pair. Note: All particles depicted travel from left to right. However, electrons and positrons is not the only particle-anti-particle pair that can annihilate into photons, and hence be pair-produced by photons. You also have muons, which are identical to electrons in every way except that it is 200 times heavier than the electron. Given enough energy, a photon can pair-produce a muon and anti-muon just as easily as it can an electron and positron. Figure 5: A Feynman diagram demonstrating an annihilation of an electrons (e–) and a positron (e+) into a photon (γ) that then produces a muon (μ–) and anti-muon(μ+) pair. But there is no reason why we need to limit ourselves only to particles that have no color charge, i.e., not charged under the Strong nuclear force. Take a bottom-type quark for example. 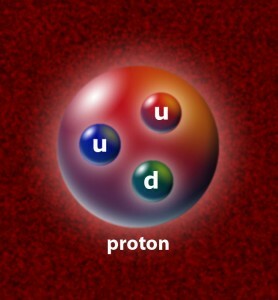 A bottom quark has an electric charge of -1/3 elementary units; a weak (isospin) charge of -1/2; and its color charge can be red, blue, or green. The anti-bottom quark therefore has an electric charge of +1/3 elementary units; a weak (isospin) charge of +1/2; and its color charge can be anti-red, anti-blue, or anti-green. Since the two have non-zero electric charges, it can be pair-produced by a photon, too. Figure 6: A Feynman diagram demonstrating an annihilation of an electrons (e–) and a positron (e+) into a photon (γ) that then produces a bottom quark (b) and anti-bottom quark (b) pair. On top of that, since the Strong nuclear force is, well, really strong, either the bottom quark or the anti-bottom quark can very easily emit or absorb a gluon! Figure 7: A Feynman diagram demonstrating an annihilation of an electrons (e–) and a positron (e+) into a photon (γ) that produces a bottom quark (b) and anti-bottom quark (b) pair, which then radiate gluons (blue). In electrodynamics, photons (γ) are emitted or absorbed whenever an electrically charged particle changes it direction of motion. And since the gluon in chromodynamics plays the same role as the photon in electrodynamics, a gluon is emitted or absorbed whenever a “colorfully” charged particle changes its direction of motion. We can absolutely take this analogy a step further: gluons are able to pair-produce, just like photons. Figure 8: A Feynman diagram demonstrating an annihilation of an electrons (e–) and a positron (e+) into a photon (γ) that produces a bottom quark (b) and anti-bottom quark (b) pair. These quarks then radiate gluons (blue), which finally pair-produce into quarks. Figure 9: A Feynman diagram demonstrating an annihilation of an electrons (e–) and a positron (e+) into a photon (γ) or a Z boson (Z) that produces a bottom quark (b) and anti-bottom quark (b) pair. These quarks then radiate gluons (blue) and a W boson (W), both of which finally pair-produce into semi-stable multi-quark systems known as hadrons (J/ψ and π). In summary, when electrons and positrons annihilate, they will produce a photon or a Z boson. In either case, the resultant particle is allowed to decay into quarks, which can radiate additional gluons and W bosons. The gluons and W boson will then form hadrons. My friend Geoffry, that is how how you can produce quarks and hadrons from electron-positron colliders. Now go! Discuss and ask questions. * The Universe’s age is measured to be about 13.69 billion years. The mean life of a proton is longer than 2.1 x 1029 years, which is more than 15,000,000,000,000,000,000 times the age of the Universe. Yeah, I know it sounds absurd but it is true. Exciting news came out the Japanese physics lab KEK (@KEK_jp, @KEK_en) last week about some pretty exotic combinations of quarks and anti-quarks. And yes, “exotic” is the new “tantalizing.” At any rate, I generally like assuming that people do not know much about hadrons so here is a quick explanation of what they are. On the other hand, click to jump pass “Hadrons 101” and straight to the news. 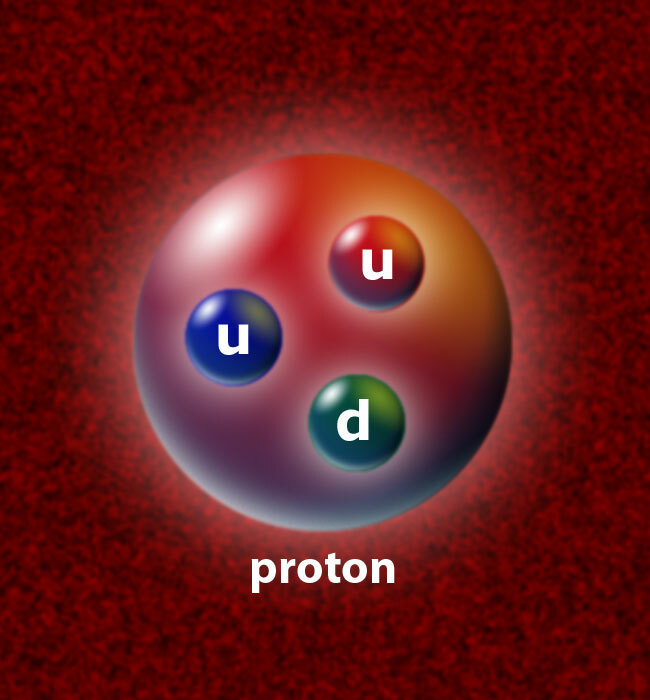 According to our best description of hadrons (Quantum Chromodynamics), the proton is effectively* made up two up-type quarks, each with an electric charge of +2/3 elementary charges**; one down-type quark, which has an electric charge of -1/3 elementary charges; and all three quarks are held together by gluons, which are electrically neutral. Similarly, the neutron is effectively composed of two down-type quarks, one up-type quark, and all the quarks are held strongly together by gluons. Specifically, any combination of three quarks or anti-quarks is called a baryon. Now just toss an electron around the proton and you have hydrogen, the most abundant element in the Universe! Bringing together two protons, two neutrons, and two electrons makes helium. As they say, the rest is Chemistry. However, as the name implies, baryons are not the only type of hadrons in town. There also exists mesons, combinations of exactly one quark and one anti-quark. As an example, we have the pions (pronounced: pie-ons). The π+ (pronounced: pie-plus) has an electric charge of +1 elementary charges, and consists of an up-type quark & an anti-down-type quark. Its anti-particle partner, the π– (pronounced: pie-minus), has a charge of -1, and is made up of an anti-up-type quark & a down-type quark. If we now include heavier quarks, like strange-type quarks and bottom-type quarks, then we can construct all kinds of baryons, mesons, anti-baryons, and anti-mesons. Interactive lists of all known mesons and all known baryons are available from the Particle Data Group (PDG)***. That is it. There is nothing more to know about hadrons, nor has there been any recent discovery of additional types of hadrons. Thanks for reading and have a great day! * By “effectively,” I mean to ignore and gloss over the fact that there are tons more things in a proton, like photons and heavier quarks, but their aggregate influences cancel out. ** Here, an elementary charge is the magnitude of an electron’s electron charge. In other words, the electric charge of an electron is (-1) elementary charges (that is, “negative one elementary charges”). Sometimes an elementary charge is defined as the electric charge of a proton, but that is entirely tautological for our present purpose. *** If you are unfamiliar with the PDG, it is arguably the most useful site to high energy physicists aside from CERN’s ROOT user guides and Wikipedia’s Standard Model articles. So KEK operates a super-high intensity electron-positron collider in order to study super-rare physics phenomena. It’s kind of super. Well, guess what. While analyzing collisions with the Belle detector experiment, researchers discovered the existence of two new hadrons, each made of four quarks! That’s right, count them: 1, 2, 3, 4 quarks! In each case, one of the four quarks is a bottom-type quark and another is an anti-bottom quark. (Cool bottom-quark stuff.) 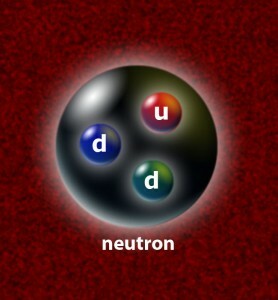 The remaining two quarks are believed to be an up-type quark and an anti-down type quark. The two exotic hadrons have been named Zb(10610) and Zb(10650). Here, the “Z” implies that our hadrons are “exotic,” i.e., not a baryon or meson, the subscript “b” indicates that it contains a bottom-quark, and the 10610/10650 tell us that our hadrons weigh 10,610 MeV/c2 and 10,650 MeV/c2, respectively. A proton’s mass is about 938 MeV/c2, so both hadrons are about 11 times heavier than the proton (that is pretty heavy). The Belle Collaboration presser is really great, so I will not add much more. Other Exotic Hadrons: When Barry met Sally. For those keeping track, the Belle Collaboration’s recent finding of two new 4-quark hadrons makes it the twelfth-or-so “tetra-quark” discovery. What makes this so special, however, is that all previous tetra-quarks have been limited to include a charm-type quark and an anti-charm-type quark. This is definitely the first case to include bottom-type quarks, and therefore offer more evidence that the formation of such states is not a unique property of particularly charming quarks but rather a naturally occurring phenomenon affecting all quarks. Furthermore, it suggests the possibility of 5-quark hadrons, called penta-quarks. Now these things take the cake. They are a sort of grand link between elementary particle physics and nuclear physics. To be exact, we know 6-quark systems exist: it is called deuterium, a radioactive stable isotope of hydrogen (Thanks to @incognitoman for pointing out that deuterium is, in fact, stable.). 9-quark systems definitely exist too, e.g., He-3 and tritium. Etc. You get the idea. Discovering the existence of five-quark hadrons empirically establishes a very elegant and fundamental principle: That in order to produce a new nuclear isotope, so long as all Standard Model symmetries are conserved, one must simply tack on quarks and anti-quarks. Surprisingly straightforward, right? Though sadly, history is not on the side of 5-quark systems. PS, I am always happy to write about topics upon request. You know, QED, QCD, OED, etc.